When visiting a city for the first time, most people resort to guidebooks or the internet to find points of interest and activities. Being a lover of great urbanism, I take a slightly different approach than most. 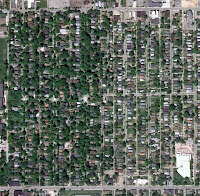 My interests lie in finding great neighborhoods, so I locate the city on Google Earth and I look for the areas that boast the densest tree cover. I have a theory that some of the most interesting neighborhoods are the ones that appear to be the greenest when viewed from above. This does not necessarily mean that you will find the best architecture in these places, although you often do. In many cases, the character of the buildings is quite subdued; the trees are what add a layer of complexity to the scene. These places also tend to have a historic designation associated with them, whether they are locally or nationally registered. I recently had the opportunity to put my “great neighborhoods” theory to the test yet again in a visit to Indianapolis, and I was not disappointed with the result. Woodruff Place, located just east of Downtown Indianapolis, was established in 1872 as one of the city’s earliest suburbs. Designed as a “residence park,” the 77-acre site was platted to accommodate 240 homes. Houses front onto the three oak and magnolia-lined north-south streets, each of which has a generous median that runs its entire length. The medians are embellished with trees, shrubs, and civic art – fountains, urns, and statuary. An east-west street connects the three median streets, with large fountains placed at the center of each intersection. Looking at the aerial above, it is quite easy to identify the boundaries of Woodruff Place – the trees give it away. While the housing stock, density, and street pattern are consistent across all of the neighborhood fabric that is shown, the difference between Woodruff Place and its surroundings is palpable. Having visited on a day when temperatures were approaching the lower 90s, walking in this neighborhood was quite a pleasant experience. The temperature on the street was much cooler than that of other neighborhoods, thanks to the tree canopy. There was also an increase in the diversity of species that could be found as a result of this generous habitat. The songs of birds filled the air while squirrels scampered from tree to tree – quite an idyllic setting. There also seemed to be a greater number of people spending time outdoors in Woodruff Place, be it maintaining their properties or walking their dogs, than in other neighborhoods in the city. The abundance of trees is not limited to the main rights-of-way; trees of all sizes could be found throughout the lots. This lush environment, along with dirt or brick-paved lanes, lends the alleys that serve the properties an almost rural feel when compared to the streets. Aside from their aesthetic and ecological value, it is clear that trees have many important roles to play in our neighborhoods. They are able to shape space by forming the walls and ceiling of outdoor rooms; they offer protection from the elements; they provide traffic-calming and sound barrier functions in an aesthetically pleasing manner; they create memorable places. They are a source of civic pride – they are often the oldest residents in the neighborhood. Perhaps if we continue to include trees in our designs, people will continue to write about these neighborhoods. It worked for Woodruff Place, the inspiration for Booth Tarkington’s fictional town in his Pulitzer Prize winning novel The Magnificent Ambersons. This blog is dedicated to all things related to urbanism, town planning, architecture and the public realm. It features contributions by members of the Dover-Kohl team. All images and text are copyright 2011 Dover, Kohl & Partners and/or their respective owners. For use of text or images in traditional print media or for any commercial licensing rights, please email info@doverkohl.com for permissions or higher resolution images. However, Dover-Kohl permits the quoting of images or text on your non-commercial blog, website, or Facebook page as long as you give a credit and link back. Students can also quote images or text in their school reports. © Dover, Kohl & Partners. Powered by Blogger.